The city of Ladonia, in Fannin County, has lost water production with Well 2. Well 1 had been down for some time. Residents and businesses in Ladonia do not have running water. County and state officials have been notified and First Responders are also aware and this incident. Multiple Volunteer Fire Departments and businesses in Hunt County have taken water donations and sent them to the city of Ladonia, and to the Ladonia Volunteer Fire Department. 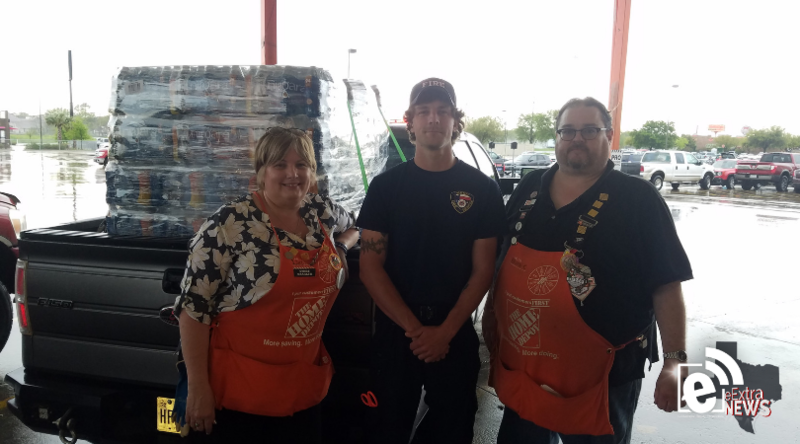 Pictured is Linda Giles, store manager of the Greenville Home Depot, along with Merit Firefighter Tyler Bowman and Home Depot Specialist/Merit Firefighter Brian Cowie with a pallet of bottled water on its way to Ladonia.